Alzheimer’s Society Cymru staff, supporters, volunteers and people affected by dementia marked this year’s Dementia Awareness Week by uniting against dementia with Glamorgan County Cricket Club. The squad met on Thursday 18 May, before the start of training for their match against Nottingham, to mark the Club’s commitment to become Dementia Friendly. The team at The SSE SWALEC, including Glamorgan players, Stadium staff, security and other partners, have committed to make as many Dementia Friends as possible over the next six months and are united against dementia this Dementia Awareness Week. Alzheimer’s Society’s Dementia Friends programme is the biggest ever initiative to change people’s perceptions of dementia. It aims to transform the way the nation thinks, talks and acts about the condition. A Dementia Friend learns a little bit more about what it’s like to live with dementia and then turns that understanding into action – anyone of any age can be a Dementia Friend. There are over 68,000 Dementia Friends in Wales. Glamorgan CCC Chief Executive Hugh Morris said; “Glamorgan CCC are pleased to partner with Alzheimer’s Society Cymru in supporting Dementia Awareness Week. Sport plays a crucial role in creating memories for people of all walks of life and we’re committed to doing our part in becoming dementia friendly. “This year we asked people to come together to unite against dementia, forgetting their differences to help urgently find a cure, improve care, and offer help and understanding. 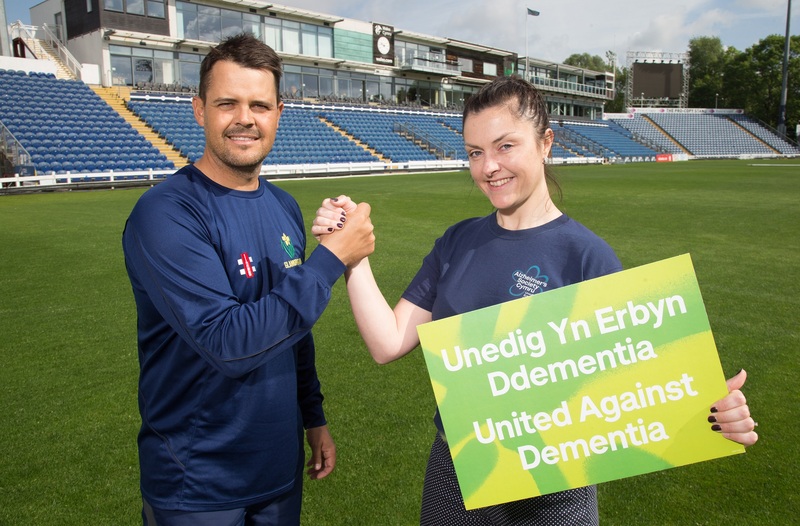 “It’s great to have Glamorgan Cricket and the whole team at the stadium on board during Dementia Awareness Week, rallying to help us tackle dementia through their membership, supporters and visitors to The SSE SWALEC. “In addition to making as many Dementia Friends as possible, they will also be supporting Alzheimer’s Society Cymru’s Side by Side volunteering project and helping to raise much needed funds to support people affected by dementia during the summer games.